Just 2 years into his career, Rougned Odor finds himself as the 7th-ranked fantasy second baseman on our list. Rougned will be 22 years old by the start of the 2015 season, so the obvious advice is for you keeper league fantasy owners. Draft him, keep him, benefit from him as long as you can, man. In 2014, Rougned hit a respectable .259 (especially for a 20-year-old rookie) along with 39 Runs, 9 HR and 48 RBI in 114 games. In 2015, Odor missed time with injuries in May, June and August, so he only played in 120 games. In those 120 games, he hit .261 with 54 Runs, 16 HR and 61 RBI. Again, he’s only going to be 22 this season, but if his power is already improving, we see no reason why it won’t at least stay where it is. Also, with his batting average remaining consistent, there’s no reason to expect a down-turn in his fantasy production. He is another one of those guys who strikes out way more than he walks, but we’re willing to forgive him since everything else is consistent. The most-important factors to Rougned Odors’ fantasy predictions in 2015: Stolen Bases and Triples. 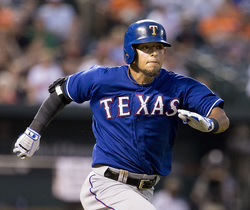 Rougned Odor will be 22, and we expect a full, healthy season with consistent stats and an increase in stolen bases. *Triples and steal attempts indicate he has the speed to steal bases once he learns how to read pitchers better at the major league level. *Bad walk-to-strikeout ratio indicates on-and-off streaks. *Consistent batting average in his first two seasons indicates you can count on him to break out of slumps. *Increase in power numbers from age 20 to 21 is a sign of tremendous power potential through his 20s as his baseball IQ rises. *Nearly-equivalent Runs and RBI totals show he has the potential to be a 100-25-100 type of player depending on where he hits in the lineup. Stolen Bases, Caught Stealing and Triples: Odor has a total of 10 stolen bases vs. 14 caught stealing along with his 16 triples in limited time in two seasons. Looking at these numbers, and despite the poor stolen base success-to-failure ratio thus far in his career, you can expect Rougned Odor’s stolen base totals to rise, likely this season. Clearly, hitting that many triples, Odor definitely has the speed to steal bases. Also, with that many attempts, his coaches also understand he has the speed to steal bases, otherwise they wouldn’t keep sending him. Once he learns to read pitchers better – hopefully this season – he could easily hit the 15-20 stolen base mark, or even more. In winter ball and the minor leagues combined, he has 70 steals to just 28 caught stealing. This is more evidence he has the speed, just not the experience at the major league level, yet. Keep in mind, again, he’s only 22 this season, so his physical abilities (in this case, specifically his speed) are identical, if not improved, so looking at his minor league stats is definitely relevant when evaluating his potential. Expect a significant rise in stolen bases for Rougned Odor in 2015 while the rest of his offensive fantasy stats should remain consistent.